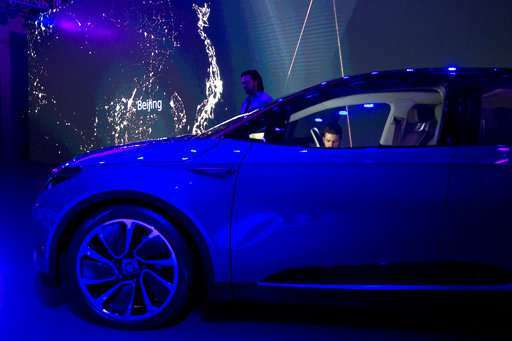 The biggest global auto show of the year showcases China's ambitions to become a leader in electric cars and the industry's multibillion-dollar scramble to roll out models that appeal to price-conscious but demanding Chinese drivers. Auto China 2018, which opens this week, follows Beijing's decision to allow full foreign ownership of Chinese automakers in a move to make the industry more flexible as it promotes electrics. The ruling Communist Party has transformed China into the biggest market for electrics with billions of dollars in subsidies to producers and buyers. Now, Beijing is winding down that support and shifting the financial burden to automakers with sales quotas that push them to develop models Chinese drivers want to buy. 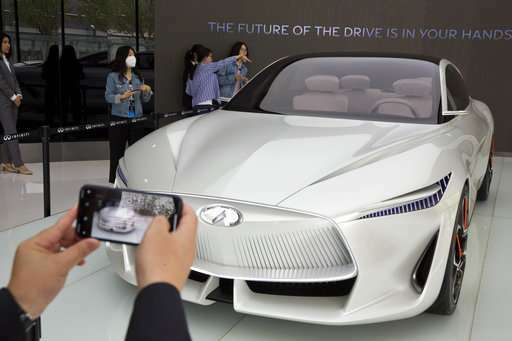 That is reflected in the auto show lineup: Global and Chinese brands including General Motors Co., Volkswagen AG and Nissan Motor Co. plan to display dozens of electrics and hybrids, from luxurious SUVs to compacts priced as low as 152,000 yuan ($24,000). Communist leaders see electric cars as both a way to clean up smog-choked cities and a key ingredient in plans to transform China into a global competitor in an array of technology fields from robotics to solar power to biotech. 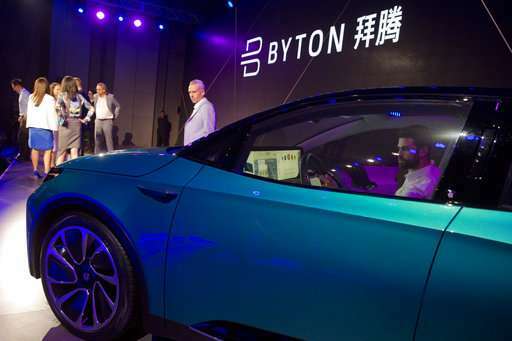 "Just in the last two or three years, China rose from being a very small player in the global EV market to be nearly 50 percent of sales in 2017," said Christopher Robinson, who follows the industry for Lux Research. "It attracted nearly every automaker in the world," said Robinson. Starting in 2019, automakers will be required to earn credits by selling electrics or else buy them from competitors. More stringent fuel efficiency standards will require a big share of each brand's sales to be non-gasoline models. 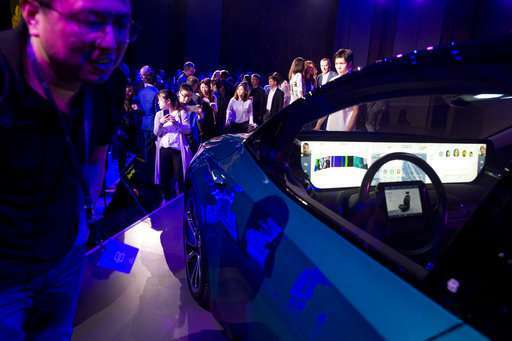 Global automakers say electrics should account for 35 to over 50 percent of their China sales by 2025. "There is huge potential for vehicle electrification here," said Roland Krueger, chairman of Infiniti Motor Co., Nissan's luxury brand. 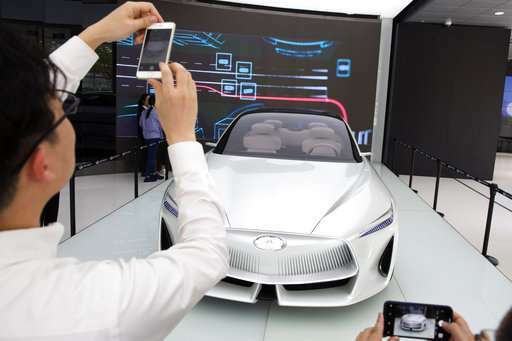 Chinese sales of electrics and gasoline-electric hybrids rose 154 percent in the first quarter over a year earlier to 143,000 units, according to the China Association of Automobile Manufacturers. That compares with sales of just under 200,000 for all of last year in the United States, the No. 2 market. GM plans to display five all-electric vehicles including a concept Buick SUV it says can travel 600 kilometers (375 miles) on one charge, plus a hybrid Cadillac XT5 28E. The Detroit automaker, which vies with VW for the status of China's biggest brand, is launching 10 electrics or hybrids in China from in 2016 to 2020. VW is due to launch 15 electrics and hybrids in the next two to three years as part of a 10 billion euro ($12 billion) development plan announced in November. Nissan is unveiling an electric model at the auto show designed for China and will display an updated version of its Leaf and an electric concept car. The Japanese automaker also plans to develop a lower-priced electric with a local partner, state-owned Dongfeng Motor Co. Two more versions of that are to be sold under their jointly owned Venucia brand. China's BYD Auto, the biggest global maker of electrics by volume with 2017 sales of 113,669 units, plans to unveil two new hybrid SUVs and an electric concept car. The company also plans to display nine other hybrid and plug-in electric models. 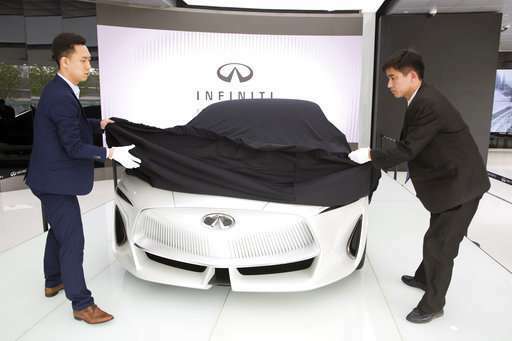 Infiniti plans to display a concept sedan, the Q Inspiration, that Krueger said will be the basis for future electric models. 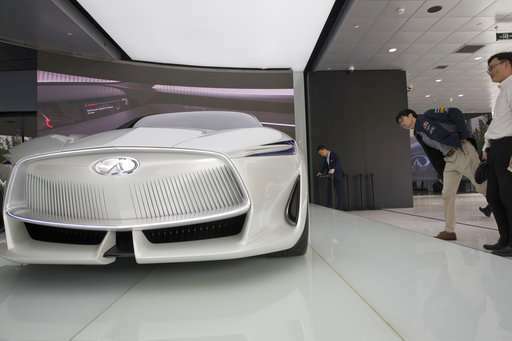 The sleek Q Inspiration has no air-drawing engine, and thus no front grill—a change Krueger said was suggested by Chinese designers at Infiniti's Beijing studio. 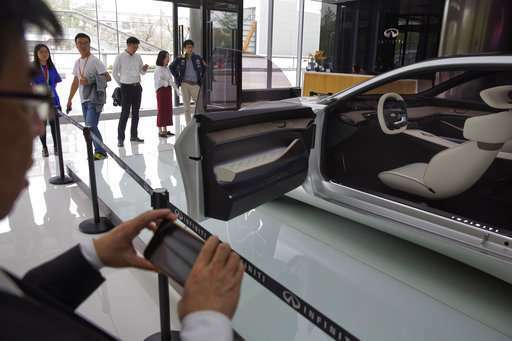 The car has the roomier back seat that has become standard among luxury brands that want to appeal to Chinese customers who have a driver and ride in back. "The first car is going to cater specifically to the needs of the Chinese market," said Krueger. Ford Motor Co. has announced a "product onslaught" this month for China that includes at least 15 electrified vehicles and 35 other models through 2025. Ford's first plug-in hybrid in China, the Mondeo Energi, went on sale last month. Washington and other trading partners have been irked by the Chinese controls that required global automakers to work through state-owned local partners and imposed other restrictions. Automakers complained joint ventures were cumbersome and expensive but complied because they gained access to a market that passed the United States in 2009 as the world's biggest. Last year's sales of SUVs, sedans and minivans totaled 24.7 million units, compared with 17.2 million for the United States. 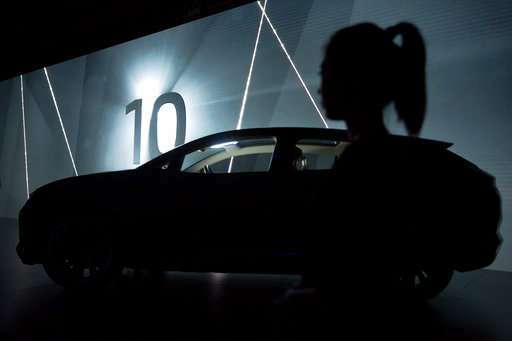 The Cabinet's planning agency announced last week Beijing will loosen those controls by allowing full foreign ownership in the industry, starting with electric vehicle producers this year. Limits for commercial vehicles would end in 2020 and for all passenger vehicles in 2022. That would end a 50 percent cap on foreign ownership of an auto venture, a limit that required automakers to share technology with potential competitors, adding to President Donald Trump's trade complaints against Beijing. "Now you're going to see the difference between the partners that you want and partners imposed on you," said Carlos Ghosn, chairman of the Renault-Nissan-Mitsubishi alliance. Ghosn said his companies were happy with their Chinese partners. But he said with electrics, autonomous driving and other innovations give companies a new chance to consider a partnership or work independently. "Every time there is a new opportunity we're going to consider, should we go with a partner? What are the advantages? Or should we go by ourself?" said Ghosn. "This is a new freedom for carmakers, which is welcome." Still, while electrics may be China's future, most brands lose money making them. Profits come from sales of SUVs that are wildly popular with Chinese drivers who see them as the safest option on the country's rough, chaotic roads. First-quarter SUVs sales rose 11.3 percent over a year earlier to 2.6 million, or almost 45 percent of all auto sales, according to CAAM. Electrics accounted for just over 2 percent. The electric cars shown are to low, the seats are like buckets, why does anyone think the size and interior changes when you change the engine. It appears to have neglected a minor point that just like petrol and diesel cars have and can fill up in a jiffy, the electric cars fuel tank. The reason there are no electric Volkswagen Tiguan's out numbering diesel Tiguan's is there is no battery to compete with the Tiguan's fuel tank. We do not need a flashy motor show of impractical designed electric cars. A dull boring electric battery show of batteries powering 150hp electric motors giving 400 miles on a full charge on full power will do just fine! A reason the seats are like buckets is related to the electric fuel tanks capacity, instead of making bigger capacity electric fuel tanks they make the seats so small that make a pygmy child wriggle and squirm to cut down on the ounces instead. HOW are these electric cars intended to run in Alaska when you're saving ounces in weight reduction. The cars heater runs of electricity, today's batteries will not last 5 minutes in Alaska. Originally I was just thinking of keeping the passengers warm, but it answers the question. It drains the battery just to keep the battery warm before keeping the passengers warm. The double irony; use fossil fuelled power stations to charge up your electric batteries! Using Newton's laws of acceleration, momentum and inertia kills two birds with one stone; by virtue of its motion produces electricity, as acceleration is a force which equal the weight of the vehicle produces motion without wheels, instantly removing skidding on ice, by being held in space by Newton's forces of inertia. and to think we still send rockets to mars spewing out propellent antialias_physorg.